As simple as it gets? A rectangular single step hull with a F.N. 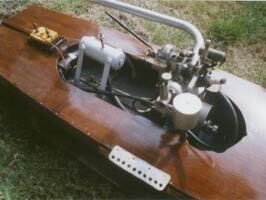 Sharpe/Grayson 25/30cc four stroke bolted to bearers on top of the step. The step is unusually far back and with the battery at the stern should have proved fun when it came to getting the hull balanced. 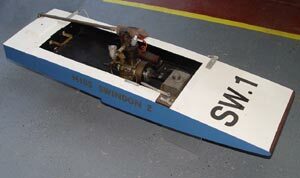 The second of the boats built by Mr Baxter to carry the Miss Swindon name. 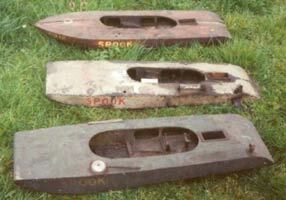 Part of the late Gerry Colbeck's collection of vintage hydros that have resided at Pitsea. In the late 1930s and through the war years. Fred Lowne of the Blackheath Club who owned an instrument company in Lea Green built a series of flash steam engines, notable for their ingenious valve gears. 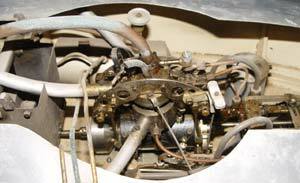 The smaller engine that he built for his 'C' Class boat 'Little Otter' had a piston valve operated by two overhead camshafts with complimentary profiles. Almost desmodromic in a way. 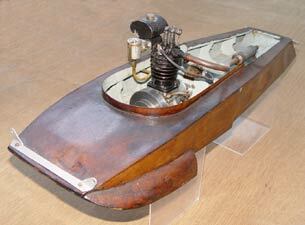 At only 9/16th bore this little engine could manage over 25mph, at which stage the hull became completely unstable. A three cylinder radial that he displayed at the Blackheath exhibition in 1941 used pushrods and bell cranks to operate the valve gear, but still with two cams at opposite ends of the crankshaft. This is his 'B' Class 'Otter' that uses the same valve gear as the radial, but with just one cylinder. Like many flash steamers, it takes a while to work out all the plumbing. Otter, Water Otter and variations were names regularly used for FS boats, being a play of words. 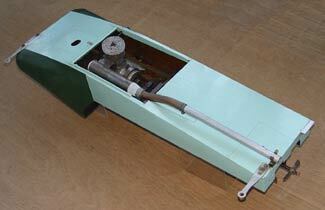 Probably the most common of the commercial hydro kits to have been built. Based loosely on George Stone's 'Lady Babs' and marketed by ED from 1948, it was not intended for racing as it did not fit any of the existing classes. Most were fitted with 2cc ED Comp Specials or similar, although the one that turned up for sale at Bilston had a 2.46 Racer. Performance is so marginal that steel cables are too heavy for it to pull round. Not impossible to find kits or hulls on the market. Another 'boat in a box'. 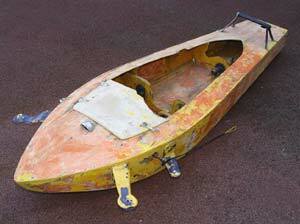 This lovely boat was built around 1950 by Norman Owst of Leicester. Better known for his model locomotives, this seems to have been something of an engineering exercise, as it was a boat 'out of its time'. The hull is a lengthened version of the pre war Westbury 24" design with the addition of two sponsons to the single step. The motor is a well engineered 15cc Westbury KIWI. Ignition is via a magneto that is part of the prop shaft, which also drives the oil pump. There is no record of the boat having been run but the motor did run quite happily before the boat was loaned to Pitsea. It also comes with a very large carrying box! 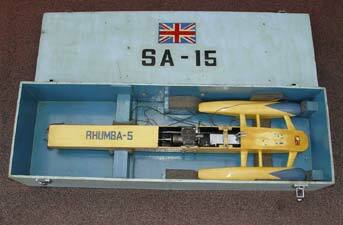 Peter Lambert did a great deal for tethered hydroplane racing and the St Albans Club. 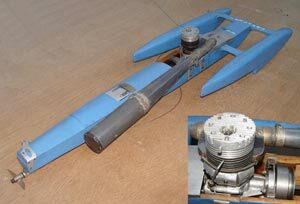 In order to encourage more people to participate, he and Ken Hyder came up with two standard designs for 5 and 10cc motors that would prove to be extremely successful. 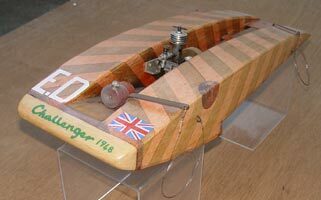 The Lambert/Hyder hydro won numerous races when it was a current design and later copies have proved to be equally fast in vintage competitions. 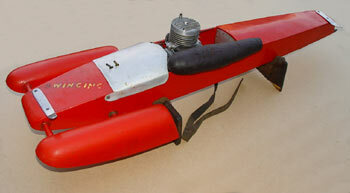 This is the 5cc version as it last raced, with flax bridles and its fitted carrying box. Getting the maximum performance from a motor depends on knowing what revs it is doing on a particular prop. Many ideas were used, including analysing photos of the propwash to count the turns of the prop, a flashing light geared down from the drive shaft, or even a little flag, again geared to the shaft that rose and fell and had to be counted. These devices were very approximate and depended on accurate counting throughout the lap. Stan Clifford came up with this mechanical 'rev counter' that indicated the engine speed on a dial facing the outside of the circle. 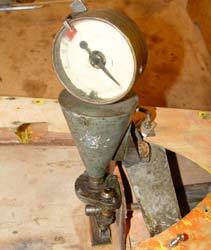 Here it is seen in 'Hell's Bells', geared driven from the prop shaft. Remarkably, the red sector on the dial starts at 20,000rpm. Mortal Remains of 'Hell's Bells'. This is the hull of the last boat that Stan Clifford built, 'Hell's Bells'. At some stage it had been stripped out and a start made on removing the paint, and this is how it has remained. The engine and most of the bits are still in existence, but restoration of those and the hull are going to be major undertakings. It is hoped to be able to bring you the complete story of Stan's long and illustrious career with tethered hydroplanes in due course, as well as progress on the task of restoring the only boat of his to have survived. 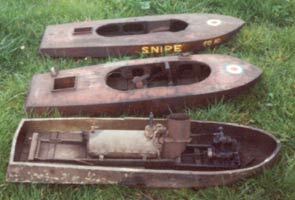 Snipe, Ogo Pogo and metal hulled steamer 3 versions of Spook, aluminium in centre Restored Snipe with 30cc OHC motor.